Sharpen up your pencil drawing skills with this expert advice. No matter what kind of artist you are, the chances are pencil drawing was the skill that helped you learn how to draw, and the one that kicked off your artistic journey. Throughout my career as a character designer and visual development artist, I've realised that having a strong respect and understanding of the process and fundamentals of drawing is essential to becoming a better artist. And what's more fundamental than pencil drawing? In this article, I'll share seven expert pencil drawing techniques to help you take your skills to the next level, whether you want to create stylised or realistic pencil drawings. 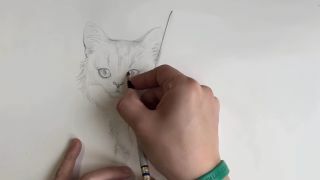 Take a look at the video above to see these pencil drawing techniques in action, or read on for my expert tips. For more in-depth advice on composition to how to capture light and shadow, take a look at our art techniques article. And if you're still trying to find the right tools for the job, we also have a guide to finding the best pencil for your drawing style. When covering large areas, I shade with my pencil perpendicular to the line I'm drawing to get wide, soft lines. For details, I hold my pencil parallel to my lines to get sharp, narrow marks. The only time I use the point is when I'm working on intricate details. I like to shade in two main ways: the first is with all of my lines going in the same direction, which makes my shading appear more cohesive. This pencil drawing technique also helps my details pop out from the lines I'm using for shading. When I've checked my drawing, I check again. I have to nail down its underpinnings before I can add details. I really avoid guessing at the details; I want to make sure things are symmetrical and look right before putting down stronger and harder lines. I constantly ask myself, does this feel right? If anything seems off – even if I can't immediately put my finger on what it is – I trust my gut and troubleshoot my drawing before continuing. This is a valuable beginner's tip: I always put a piece of paper under my hand to keep from smudging my drawing. Like every other artist I know, even after I've signed my name, I will sometimes continue tinkering with my drawings. I can always find something to change if I look hard enough, so it can be difficult to tell when a piece is truly finished.